The words "Hindu" and "Hinduism"
Usages of the words "Hindu" and "Hinduism"
It is extremely useful for the modern practitioner of authentic, traditional Yoga to be aware of two major diversions from traditional Yoga as a system of pursuing the depth of pure consciousness (atman, purusha or whatever name you choose to refer to that consciousness). One diversion is the now common and incorrect view that Yoga is a physical fitness program, rather than a process of moving towards the realization of the unity (Yoga) of the individual and the universal consciousness. This is addressed in the article Modern Yoga versus Traditional Yoga. *Please note that the explanations given here are with great respect, admiration and love for the Hindu people and culture, as well as acknowledging that there are a wide range of indigenous spiritual or religious views and practices within the geographic region. The words "Hindu" and "Hinduism" are described in different ways by different people. The origins and usages of the terms are not universally agreed upon. As you'll see in the references below, "Hindu" and "Hinduism" have been variously used to describe one or another of culture, geography, or religion. Some say that the terms were not used by the indigenous people until fairly recently in history, brought on by foreign peoples and governments, not their own evolution. 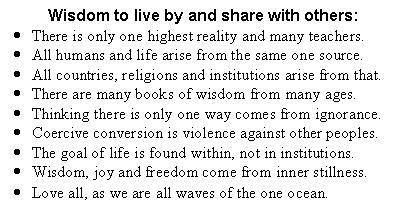 Many say that the original collective term used for the diverse teachings of this region of the world is "Dharma" or "Sanatana Dharma." There is some impetus in the world today to advocate these terms, either along side of, or instead of the terms "Hindu" and "Hinduism." Yet, it is also useful to know and bear in mind that some advocates of the words "Hindu" and "Hinduism" can be very aggressive towards those who are not, but instead prefer the concept of Dharma. This aggression can be strongly experienced by practitioners of pure non-theistc yoga, which is not necessarily linked with or promoting of any of the various sects of deity worship. A comparison that should clarify the situation is to consider that "Hindu" has historically related to a geographic region. Then reflect on the geographic regions of Africa, America (including north, central, and south), and Europe (or any other region of the world). Imagine for a moment that somebody tried to talk to you about "religions" known as Africanism, Americanism and Europeanism. Anything that had ever been done in Europe, for example, in the name of spiritual or religious practice throughout human history would be lumped under one umbrella "religion" which had various denominations, sects or orders of "Europeanism". So too, all of the practices done by any of the historical peoples in the Americas would be considered to be part of the "Americanism" religion. Imagine you live in the United States or Canada and somebody asks you "Why does your religion practice human sacrifice?" Just because some people have done this in the past in particular locations, this obviously does not mean the human sacrifice is a part of some overarching religion of "Americanism", much less that you practice this because of being resident of the Americas. Imagine that you live in one of the modern European countries and that you are asked about your personal relationship with Thor, the "Europeanism" god of Thunder. Just because there are historical religious practices in relation to Thor, this does not mean that there is a "Europeanism" with this view, or than any person in modern Europe can be presumed to follow this god. These examples are similar to what has happened in the "religion" of Hinduism. Africa, America, Europe and Hindustan ("Hindu land", is one of the popular names of India) each have their own unique and beautiful characteristics. However, it is a gross distortion of the realities of religion and spiritual practices to refer to these as "religions" of Africanism, Americanism, Europeanism and Hinduism. Even if there is such a thing as 'Hinduism' it is an illogical confusion to say that the part is the whole, in this case that Yoga is Hinduism. Is it proper to refer to a tennis player, a golfer, a cricket player, or a football player only as an 'athlete', while ignoring the particular sports skill that one possesses and practices? To say that one is a 'golfer' says something rather clear, but to just say he is an athlete says virtually nothing without acknowledging that first and foremost, he is a golfer. So too is the case with Yoga. While there are surely people who think of themselves as Yogis and Hindus, with one being part of the other, this is not a necessity or generally accurate. Many similar examples can be thought of. For example, an apple is an apple. If you want an apple, you ask for an apple. You do not merely ask for a fruit and then quietly hope for an apple. The category 'fruit' is irrelevant when what you specifically want is an apple. In my own tradition, Swami Rama has made it quite clear that ours is a meditative tradition of the Himalayan caves, emphasizing Yoga, and has nothing to do with any of the institutions in the plains of India. He has written clearly of these points in Living with the Himalayan Masters, Enlightenment without God, and A Call to Humanity. QUOTES ABOUT "HINDU" AND "HINDUISM"
"The word Hindu is not a religious word. It is secular in origin. It is derived from the word Sindhu, which is the name of a major river that flows in the northwestern region of the Indian subcontinent. The ancient Greeks and Armenians used to refer the people living beyond the river Sindhu as Hindus and gradually the name stuck. When the Muslims came to the sub continent they called the people living in the region as Hindustanis to distinguish them from the foreign Muslims. Subsequently when the British established their rule, they started calling the local religions collectively under the name of Hinduism." "'Hinduism' refers not to an entity; it is a name that the West has given to a prodigiously variegated series of facts. It is a notion in men's minds--and a notion that cannot but be inadequate. To use this term at all is inescapably a gross oversimplification." "[There was] no such thing as Hinduism before the British invented the holdall category in the early nineteenth century, and made India seem the home of a 'world religion' as organised and theologically coherent as Christianity and Islam. The concepts of a 'world religion' and 'religion' as we know them now, emerged during the late 18th and early 19th century, as objects of academic study, at a time of widespread secularisation in western Europe. The idea, as inspired by the Enlightenment, was to study religion as a set of beliefs, and to open it up to rational enquiry." "Hinduism--the word and perhaps the reality too--was born in the 19th century, a notoriously illegitimate child. The father was middle-class and British, and the mother, of course, was India. The circumstances of the conception are not altogether clear. One heard of the 'goodly habits and observances of Hindooism' in a Bengali-English grammar written in 1829, and the Reverend William Tennant had spoken of 'the Hindoo system' in a book on Indian manners and history written at the beginning of the century. Yet it was not until the inexpensive handbook 'Hinduism' was published by the Society for Promoting Christian Knowledge in 1877 that the term came into general English usage." "The English term Hinduism was coined by British writers in the first decades of the 19th century and became familiar as a designator of religious ideas and practices distinctive to India with the publication of books such as Hinduism (1877) by Sir Monier Monier-Williams, the notable Oxford scholar and author of an influential Sanskrit dictionary. Initially it was an outsiders’ term, building on centuries-old usages of the word Hindu. Early travelers to the Indus valley, beginning with the Greeks and Persians, spoke of its inhabitants as “Hindu” (Greek: ‘indoi), and, in the 16th century, residents of India themselves began very slowly to employ the term to distinguish themselves from the Turks. Gradually the distinction became primarily religious rather than ethnic, geographic, or cultural." "The word Hinduism is an English word of more recent origin. Hinduism entered the English language in the early 19th century to describe the beliefs and practices of those residents of India who had not converted to Islam or Christianity and did not practice Judaism or Zoroastrianism." "Just who invented 'Hinduism' first is a matter of scholarly debate. Almost everyone agrees that it was not the Hindus.... As a discrete Indic religion among others, however, 'Hinduism' was probably first imagined by the British in the early part of the nineteenth century to describe (and create and control) an enormously complex configuration of people and their traditions found in the South Asian subcontinent. 'Hinduism' made it possible for the British, and for us all (including Hindus), to speak of a religion when before there was none, or, at best, many." "It was the Europeans who coined the word 'Hinduism' to denote all the Indian religions except Muslims, Jains, and Buddhists, and the word Hindu was erroneously used for those following the religions and worship under Hinduism." "Hindus themselves prefer to use the Sanskrit term sanatana dharma for their religious tradition. Sanatana dharma is often translated into English as 'eternal tradition' or 'eternal religion' but the translation of dharma as 'tradition' or 'religion' gives an extremely limited, even mistaken, sense of the word. Dharma has many meanings in Sanskrit, the sacred language of Hindu scripture, including 'moral order,' 'duty,' and 'right action.'" "It is most striking that people we now call Hindus never used this term to describe themselves. The Vedas, the Ramayana and the Bhagavad Gita, which today are seen by many as the religious texts of the Hindus, do not employ the word Hindu. That term was first used by the Achaemenid Persians to describe all those people who lived on or beyond the banks of the river Sindhu, or Indus. Therefore, at one stage the word Hindu as an ethno-geographic category came to englobe all those who lived in India, without ethnic distinction. It was only under the Muslim rulers of India that the term began to gain a religious connotation. But it was not until colonial times that the term 'Hinduism' was coined and acquired wide currency as referring collectively to a wide variety of religious communities, some of them with distinct traditions and opposed practices. Communities like the Saivites, Vaishvanites, and Lingyats, each with their own history and specific view of the world, were tied together under the blanket category Hinduism." "The non-Muslim people of the South Asian subcontinent called Hindu had no precise word for their religions. They were, as they are, divided into thousands of communities and tribes, each having its own religious beliefs, rituals, modes of worship, etc. Finding it difficult to get the names of the religions of these communities, the British writers gave them the word 'Hinduism' to be used as a common name for all of their religions in about 1830. Thus the people called Hindus got a common element, at least in word, to be identified as a distinct, single community." "All scholars agree that the category 'Hinduism' is something created by Orientalists. This obviously does not exclude the existence of an Indian spiritual experience. But at a certain point it was decided to use this label, which during Colonialism became a flag for independence, and after that an attempt was made by the people of India to recognize themselves in a common religion." "Unliess by 'Hindu' one means nothing more, nor less, than 'Indian' (something native to, pertaining to, or found within the continent of India), there has never been any such a thing as a single 'Hinduism' or any single 'Hindu community' for all of India. Nor, for that matter, can one find any such thing as a single 'Hinduism' or 'Hindu community' even for any one socio-cultural region of the continent. Furthermore, there has never been any one religion--nor even one system of religious--to which the term 'Hindu' can accurately be applied. No one so-called religion, moreover, can lay exclusive claim to or be defined by the term 'Hinduism'." "The Supreme Court [of India] in the course of deciding an appeal in an election petition, has interpreted the meaning of 'Hindutva' and 'Hinduism' as a 'synonym of 'Indianisation' -- i.e. development of uniform culture by obliterating the differences between all all cultures co-existing in the country.' The unanimous judgement given by the three-judge bench consisting of Justices J.S. Verma, N.P. Singh and K. Venkataswami, on December 11, 1995, has quoted earlier Supreme Court judgements and opinions of Dr. S. Radhakrishnan, Dr. Toynbee and others in coming to the conclusion that Hinduism represented a way of life." "The Hidden Hindus... include at least 1-2 million non-Indian Americans (Caucasians, African-Americans, Hispanics, etc.) who practice Yoga, meditation, vegetarianism, believe in reincarnation and karma, study the Vedic scriptures, etc., but who –- despite the fact that they are practicing Sanatana Dharma -- will not call themselves 'Hindu', and do not understand that they are part of an ancient and living religious tradition. We need to do everything in our power to bring these two communities together, to bridge this gap." "There are legal pronouncements [in India] that Hindus are Indian citizens belonging to a religion born in India. This means Buddhists, Sikhs or Parsis, even those who did not recognize themselves as Hindus, are to be considered Hindus." "Hinduism as one of the world religions we know today had only occurred or perceived since the 19th century, when the term 'Hindu-ism' started being used by leaders of Hindu reform movements or revivalists, and, often considered to be biased, Western orientalists or the 'first Indologists'. However it is clearly accepted that sources of Hinduism and the 'streams' which feed in to it are very ancient, extending back to the Indus Valley civilization and earliest expressions of historical Vedic religion. It is not an accepted view that Hinduism is the construction of Western orientalists to make sense of the plurality of religious phenomena originating and based on the Vedic traditions, however some many have suggested it is." "From the western point of view, the understanding of Hinduism was mediated by Western notions of what religion is and how its relates to more ancient forms of belief. It is further complicated by the frequent use of the term 'faith' as a synonym for 'religion'. Some academics and many practitioners refer to Hinduism with a native definition, as 'Sanātana Dharma', a Sanskrit phrase meaning 'the eternal law' or 'eternal way'." "The name Hinduism is a misnomer and of a foreign coinage. Indeed the term Hindu is found nowhere in the Vedic scriptures, nor can it be found in any classical texts of Sanatana Dharma." "As a follower of the religion of santan dharma, I find it offensive that we use the word 'Hinduism'. This term is an illegitimate term that was used to label us by foreign occupiers and aggressors." "'Hindu' means a person believing in, following or respecting the eternal values of life, ethical and spiritual, which have sprung up in Bharatkhand [India] and includes any person calling himself a Hindu." "I wish to state emphatically and categorically that the very word Hinduism is a misnomer. Properly speaking there is no such religion called Hinduism. This great country to which I happen to belong was known from time immemorial as ‘Bharatha’. Even in Bagavat Gita Lord Krishna often addresses Arjuna‘as Bharatha’. The Ancient Country has gone through uncountable vicissitudes. Because, foreign intruders, invaders and travellers had to cross the Indus River before entering this fabulous country (it was so in the past), they began to call its inhabitants of this great and vast land as “Hindus”. This word “Hindu” requires further elaboration. The word for water in Sanskrit is “Sindu” In the Vedas and our Legends we come across such words as “Saptha Sindavaha” which freely translated would mean ‘The Land of Seven Rivers”. While other rivers have been given individual names, this river on the extreme Northwestern border was known as ‘Sindu’. Eventually, Sindu became ‘Hindu’. That is how the intruders, invaders and travellers began to call the original people of the land Hindus." "The word 'Hindu' means a liar, a slave, a black, an infidel, in short, a man possessed of every evil to be found in the world; while the term Arya means a pious, a learned, a noble, and a wise man, devoted to the true worship of the Eternal. With this explanation, I dare conclude that no man of common sense would like to be called a Hindu, when once he knows its meaning." "The word 'Hinduism' was introduced in the 19th century to define the aggregate beliefs of the Arya, immigrants who left Central Asia in 1500 BC, and animist religions of native populations in India." "The word 'Hindu' is not found in any Hindu religious text or any other ancient writing. People who lived on the western side of Hindu Kush (killers of Hindus) mountains gave this name to the natives of India. The word Hindu means black, slave, robber, thief and a waylayer." "At a very early date, Persian explorers entered the Indian subcontinent from the far Northwest. After they returned, they published chronicles. But due to the phonetics of their native Persian language, the 'S' of Sind became an aspirated 'H.' This is how the people of the Indus Valley came to be known generically as 'Hindus' by the Persians. This flawed intonation inevitably stuck. And was later re-imported when the invading Moguls conquered India. Since they always referred to the locals as 'Hindus,' the term was adopted by the Indians themselves as a way of distinguishing native culture from that of the foreign Muslims." "Hinduism did not exist before 1830. It was created by the English colonialists in the 1830s. This remarkable circumstance is evidenced by the fact that none of the travelers who visited India before English rule used the word 'Hindu'.... This is amply borne out by the Encyclopedia Britannica, which states: 'The term Hinduism ... [was] introduced in about 1830 by British writers.' In other words, the founding father of 'Hinduism' is an Englishman!" In addition to the question of the nature of the terms "Hindu" and "Hinduism," there is also the question of the dates of the origins of the underlying principles or practices. In other words, presuming that there is, in fact, a "Hinduism" (rather than Dharma or Sanatana Dharma) here are a few quotes listed in date order, which show the diversity of opinions. "The British writers in 1830 gave the word 'Hinduism' to be used as the common name for all the beliefs of the people of India excluding the Muslims and converted Christians." "Only 180 years ago Raja Ram Mohan Roy coined the word 'Hindu' Hinduism did not exist before 1830. It was created by the English colonialists in the 1830s." "It is interesting to note that the word Hindu is neither Sanskrit nor Dravidian and did not originate in India. It was not used by Indians in their descriptions or writings until the 17th century." 1500's CE: "The word 'Hinduism' was coined by European travelers and traders in the 16th century." 1000 CE: "The word Hinduism was coined by the Muslim scholar Alberuni in the 11th century C.E." "Beginning around 1000 AD, invading armies from the Middle East called the place beyond the Sindhu 'Hindustan' and the people who lived there the 'Hindus'"
600 BCE: "The beginning of Hinduism and the Indian subculture can be dated circa 600 BCE." 1000 BCE: "No one is completely sure of where Hinduism was started and by whom. Their oldest written documents, the Vedas, were written down in 1000 BC." 1500 BCE: "Hinduism was born in India around the year 1500 bc." 1800 BCE: "Hinduism began in India about 1800 B.C.E." 2000 BCE: "Hinduism's roots date back as far as 2000 BC." 2500 BCE: "Hinduism in India is the most primitive religious belief. It dates back to its origin of about 2500 BC." 3000 BCE: "Hinduism is the oldest extant religion dating back to over 3000 BC." 4000 BCE: "Hinduism began in India about 3,500-4,000 B.C." "Hinduism began about 6,000 years ago." 6000 BCE: "Hinduism started in... 6000 BC"
6600 BCE: "Hinduism began somewhere around 6500 BC"
8000 BCE: "Hinduism began in Bharat Varsha (Indian subcontinent) in 8000 BCE." The Persian term (Middle Persian Hindūk, New Persian Hindū) entered India with the Delhi Sultanate and appears in South Indian and Kashmiri texts from at least 1323 CE, and increasingly so during British rule. Since the end of the 18th century the word has been used as an umbrella term for most of the religious, spiritual, and philosophical traditions of the sub-continent, excluding the distinct religions of Sikhism, Buddhism, and Jainism. The term Hindu was introduced to the English. It generally denotes the religious, philosophical, and cultural traditions native to India. Hinduism has been perceived as one of the world religions we know today only since the 19th century, when the term 'Hindu-ism' started being used by leaders of Hindu reform movements or revivalists, and, often considered to be biased, Western orientalists or the "first Indologists". From the western point of view, the understanding of Hinduism was mediated by Western notions of what religion is and how it relates to more ancient forms of belief. It is further complicated by the frequent use of the term "faith" as a synonym for "religion". All of the quotes below are excerpted from the above titled book, which was published in January 2010. I include these quotes so as to touch on the controversy over the possible "construction" of Hinduism, particularly in the past couple hundred years, and how this may not relate to any traditional realities in the region known as either modern India or the Indian subcontinent. The book is a collection of articles/chapters from nine different authors. This is an academic publication and is rather expensive (I paid $114 for a copy through Amazon), though it is extremely insightful if you wish to explore this issue more closely. This is the finest overall summary of the issue that I have encountered. The preface of the book is written by Rajaram Hegde, Shankaraghatta, India, June 2009. I gradually started to realize that I could neither fully understand nor participate in the debates and theory building on 'religion' and 'secularism', because they were completely unrelated to my lived experience. I had never seen a phenomenon like Hinduism, the religion to which I was supposed to belong. No one in my family or the traditional society in which I grew up had instructed me about any such thing called 'Hindu dharma' and its characteristic features. It was only through my school education that I learned about this 'Hinduism', which is supposed to consist of religious scriptures called the Vedas and the Bhagavad-Gita, beliefs about reincarnation, social divisions called the four varnas and things like ashramas. Sharing my experience with friends, colleagues and acquaintances, I discovered that they too, without exception, had similar experiences. If the common experience of Indians does not know of any such thing as Hinduism, what are these 'religions' that we have been trying to investigate for all these years? Why is it that social science research brushes aside this experience, as though it is without value or importance? Why is it that these peculiar concepts and vocabulary are being forced upon us as truths about our society that we all have to accept? What is the nature of this 'religion' that we see and judge in the name of secularism or Hindu nationalism? In the field of religious studies there is a longstanding problem of how to recognize Hinduism as a religion. The tremendous diversity of doctrines, texts, gods and practices in India has puzzled scholars, missionaries and others who tried to get a grip on the Indian religion. As an answer to this problem many scholars have stated, from an early period onwards, that Hinduism is not one religion, but should be seen as a collection of many separate religions or faiths. Against this background, Wilfred Cantwell Smith's influential work "The Meaning and End of Religion" argues that the concept of Hinduism is a construction of the West. 'Hinduism', he says, 'refers not to an entity, it is a name that the West has given to a prodigiously variegated series of facts. It is a notion in men's minds ¾ and a notion that cannot but be inadequate. The name 'Hinduism', he argues was wrongly given to the varied series of Indian religious facts as if these formed one system of doctrines. According to Smith, this misconception was the result of the use of a Christian, and more specifically, a Protestant conception of religion as systems of doctrines. In the account of the European and colonial contribution to the construction of Hinduism many have provided a genealogy of the term 'Hinduism' and the notion of a pan-Indian religion. Even critics of the constructionist thesis agree that the word 'Hinduism' is relatively young and not native to India. The term 'Hindu' is traced back to the ancient Greek and Persian 'Sindhu', which referred to anything native to the region beyond the river Indus. this is also, many authors argue, how the Muslim administration later used it: not to denote a people united by religious identity but to bring together various communities within the political structure of imperial Muslim rule. Thus, the term 'Hindu' did not ascribe religious unity to these communities and was inclusive of Indian Muslims and Christians. Europeans only adopted the term 'Hinduism' as a name for the religion of India towards the end of the eighteenth century. Before that, European travelers and missionaries had regarded the Indian traditions as instances of heathendom. Heathendom or paganism, according to medieval Christianity, was one of the four religions of the world, next to Christianity, Judaism, and Islam. The Indian form of paganism later acquired the name 'gentooism', followed by the 'religion of the Hindus' to be finally replaced by 'Hindooism', and then 'Hinduism' by the end of the eighteenth century. The constructionist thesis has it that, in this process, different religious phenomena wrongly came to be seen as parts of one religion of all Hindus. The form attributed to this religion was based on a Christian understanding of what religion is. Europeans, so the argument goes, focused only on those aspects which they considered to be properties of religion, viz. sacred texts, doctrines and priests, while neglecting the myriad of other aspects of Indian religion. As a result they mistook Brahmanism¾with its texts and priests¾for the religion of all Hindus. This idea of a unified and clear-cut Hindu religion was then used by the British to rule India. Several colonial administrative measures, based on the idea of one Hindu religion, helped in creating this religion: the census and legislation of aspects related to religion. To summarize, three elements are identified as central to the role played by the Europeans in the construction of Hinduism: a western Christian concept of religion, the idea that the Indian religions formed one pan-Indian religion and the needs of the colonial enterprise. What I have argued is that Hindus did in fact share a religious identity as Hindus at least as far back as 1400 and probably much arlier as well. On the other hand, it is also clear that outside observers, both Hindus and on-Hindus, may justifiably regard the members of certain heterodox religious groups to be Hindus although these persons themselves may not regard themselves to be Hindus, or at least not exclusively Hindus. European expansion overseas, beginning with Portuguese explorations in the fifteenth century, and leading to an increased contact with non-European peoples in the Indian ocean and elsewhere, was a crucial factor in the development of European ideas of 'paganism' or 'heathensim'. In fact, the naming of 'Hinsuism' was the end point in a long process of European reflection and attempts to make sense of new knowledge and expanding horizons. I have identified two broad trends in terms of the approach of protagonists in the debate about how to shape a religion called Hinduism: one which sought to articulate the idea of Hinduism through the restructuring of society, as exemplified by some elements within the Arya Samaj; and one which sought to articulate the idea of Hinduism through the consolidation of the existing structures of society, emphasizing 'organic' unity of the component parts. No one can travel in India an shut his eyes to the benefits conferred on its inhabitants by English rule. In fact, our subjugation of the country affords an exemplification of the now trite truth that the conquest of an inferior race by a superior, so far from being an evil, is one of the great appointed laws of the world's progress and amelioration. Colonial rule not only provided opportunities to further the cause of the Christianizing mission, but it also came to be seen as an act of Divine Providence. Some missionaries... even saw Britain as the chosen nation entrusted with the task of evangelization. Therefore the conquest of other lands was seen as a rightful and legitimate activity undertaken by civilized societies for the material, moral and spiritual benefit of the conquered.... They saw themselves as bringing rationality and Christian enlightenment to the benighted natives. The word 'religion' itself is problematic in that it has been defined and interpreted in many different ways (both in complementary and contradictory terms). Whether it can be treated as a universal category has been called into question. As is well known, the concept 'religion' which has come to be used for European engagement with other religious traditions is also problematic in that it is deeply rooted in nineteenth-century western Christian theology and is seen as universally valid--an issue that has engaged western academic discourse and continues to pose challenges. The marks of colonialism are visible in the nineteenth-century construction of the category of 'religion' itself as well as in what came to be called "Comparative Religion" or the 'Science of Religion'. [Explaining the views of nineteenth-century Baptist missionary William Ward] What is 'false' or 'true' is seen in terms of Christian notions of natural and special revelation. It is the gift of special revelation that makes Christianity a 'true' religion. In other words, Christianity is the revealed religion and others are repositories of natural revelation. The implication is that others are false. It seems to be a contradiction in terms to look for 'religion' when one begins with the conviction that there can be only one 'true' religion.